The new OM 113 1LP is part of our new OM100 series of more affordable, dual power stereo microscopes introduced in 2011. 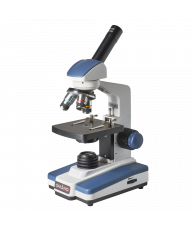 It features dual power 10x/30x magnification with a single top light for a good value, entry-level stereo microscope, ideal for the teaching environment. The 45-degree inclined binocular head provides a comfortable viewing position with a compact, 50mm working distance. For additional space, the entire focus arm rotates 360 degrees around the mounting pole to accommodate viewing larger objects such as archeological exhibits or rock specimens. Reliable top lighting provides warm, even illumination of 3-D objects and precision-crafted rack and pinion gears bring the subject into clear, sharp focus. The rugged metal housing is designed to withstand the rigors of daily use. 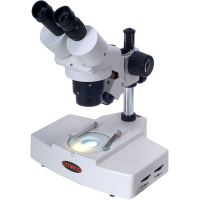 This microscope has been manufactured under the strict guidelines established under ISO 9001:2000 Standards. 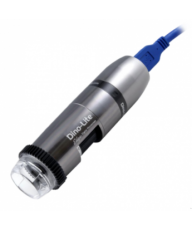 The new OM 113 1LP is part of our new OM100 series of more affordable, dual power stereo microscopes introduced in 2011. 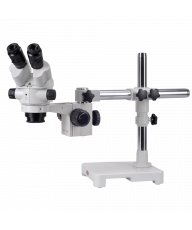 It features dual power 10x/30x magnification with a single top light for a good value, entry-level stereo microscope, ideal for the teaching environment. The 45-degree inclined binocular head provides a comfortable viewing position with a compact, 50mm working distance. For additional space, the entire focus arm rotates 360 degrees around the mounting pole to accommodate viewing larger objects such as archeological exhibits or rock specimens. 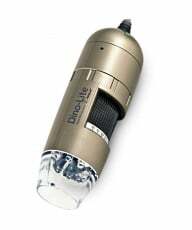 Reliable top lighting provides warm, even illumination of 3-D objects and precision-crafted rack and pinion gears bring the subject into clear, sharp focus. The rugged metal housing is designed to withstand the rigors of daily use. 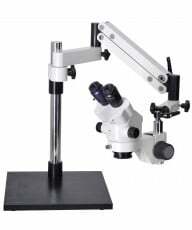 This microscope has been manufactured under the strict guidelines established under ISO 9001:2000 Standards.